The first thing to understand is to know what Tajweed is. It is derived from a word Jawada which means “improving or bringing perfection or proficiency”. Reading the Quran in the best manner and with the rules of recitation is the name of following Tajweed. We are Muslims and when we read the Book of Allah, we should do it with the best effort. The Quran is the best speech because it is the words of Allah and it is the perfect Book. So, there must be perfection in its recitation. Perfection in recitation means there should be no mistakes and errors. Pronunciation should be correct and the voice should be beautiful. It basically means improve something. There are special courses through which Muslims can learn the recitation of the Quran in the best way. Muslims are required to read the Holy Book slowly and softly. Quran is the divine book of Allah. It was sent upon the last prophet Muhammad (PBUH) and is considered to be the complete code of life; with guidance relevant to every field of life for all those who seek it. It is the last book which marked the end of Prophet Hood in Islam and contains complete knowledge to guide Muslims through all aspects of life. It is not only important for Muslims to learn Quran but is also vital to understand its true essence and meaning. This is why countless Tajweed and Tarteel courses are offered online. Quran with kids is one such website which is offering a comprehensive and detailed study of the Quran with Tajweed to benefit the Muslim in all parts of the world. The aim of Quran with kids is to spread the teaching and guidance of the Quran to all parts of the world. It is a great facility for all people who live away in foreign countries and find it difficult to keep their children close to their religion in western culture. Quran for kids is the best online Quranic academy that is teaching Tajweed to children. The aim of this online academy is to help children and people of all ages learn Quran with Tajweed. It is also breaking through into countries where teaching and learning Quran openly is now easy. This is the most basic course being offered online by the Quran for kids. It includes learning the basic Tajweed and Tarteel rules and principles and helping students establish an association and identification with the Arabic words and letters. This helps people become familiar with the language and recognize the sounds and pauses. Through this course, students are helped to learn the basic surahs and verses of the Holy Quran. It has been revealed that learning the Verses of Quran is Sunnah. Tarteel means recitation and Tajweed mean improvement and understanding. The Tajweed and Tarteel course aid students to develop a complete in-depth understanding of the verses of the Quran. The purpose of the Arabic course is to learn and understand the Arabic language. The tutors assist students in forming an affiliation with the language and helping incorporate the language into their daily routine. Learning the Quran is very important for Muslims as it is their foremost obligation. Learning the Quran is not only important for adults but it is equally important for the kids. So the parents should be serious about the necessary Quran education for their children from the very beginning. Today the world has become digital so the parents can benefit from Online Quran learning for Kids. The online Quran centers offer this service so that the children can take the Quran education along with the school education. At present, human life has become very busy. In everyday life, a lot of commitment, sometimes it becomes very difficult to get the time for taking the Quran correctly. Quran is an obligation for every Muslim man and woman. Unfortunately, people are not focused on this obligation, as they are too busy in the affairs of the world. Occupation in life, we must all take time for the Muslim Quran. If you can learn to properly learn the Quran, then you should consider participating in any network Quran Academy. The Quran is our heavenly book and knowledge is summarized in this heavenly book. Quran is a deep ocean of knowledge that’s why Muslims emphasize the learning of Quran for adults and kids. Children need friendliness and congeniality so parents need to Find female Quran teachers for kids. If a teacher is a good communicator and possesses a deep knowledge of the Quran, the children will have efficient Quran education. Everyone wants to have a teacher for kids who has an engaging personality and remarkable teaching style. How to Learn Quran? Our Academy offers Online Quran Learning for worldwide Muslims. They can learn to read Quran at home. We also offer learn Quran for Kids facility. Our Holy book contains guidance for mankind. The teachings of our Holy Book can help us have a prosperous life. We must follow these teachings and make our children also get familiar with them. The Holy Book is in Arabic, so it is really difficult for Non-Arabs to understand and even read it. A person who wishes to learn the recitation in the proper manner must have to learn the Tajweed. It is the basic of recitation in which you learn the pronunciation of the Arabic words. You start with the Arabic letters and then move to the words. For learning the Koran you need some skills and expertise. You can join classes to learn these skills. If you pronounce any word in a wrong way, it will change the entire meaning of the word. You therefore need complete learning and knowledge of recitation. Proper learning requires a proper institute where you can find the guidance of a teacher. If you are living in western countries, you may come across many issues in joining proper institutions. Many people ask that how to learn Quran if they don’t have an access to a local tutor. You can learn online and find the solution to finding the best institute for learning the Quran. This learning is the only best solution if you do not have a local teacher. There is no need to be physically present at the Islamic center or mosque for attending your lessons. 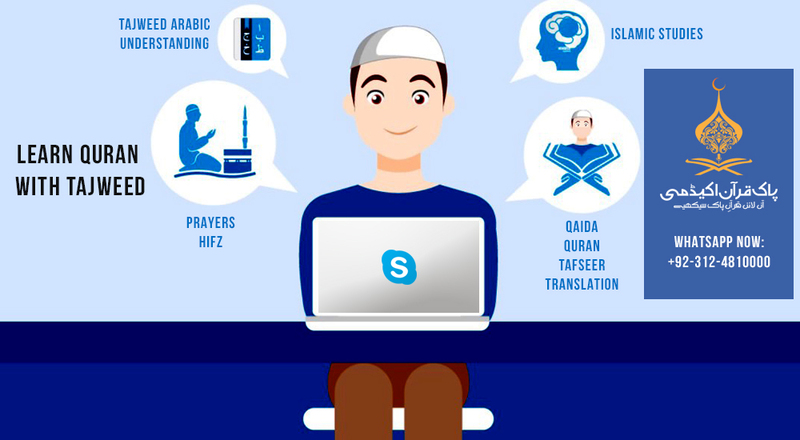 Online Quran Learning is similar to learning in a face-to-face class and also has a lot of advantages. You can stay at your home and take the lessons from the professional teachers. These teachers are experienced and have the complete knowledge of the Quran. The students can easily learn to read Quran, memorize and study it in detail if they take online lessons. These classes are very convenient and allow the students to focus only on their lessons. You can learn Quran online at home but you need a computer or portable devices like a Smartphone, tablet or a laptop. The students can take classes almost anywhere. They will save their time and spend it on other productive activities. There are a lot of benefits of learning in this way. The greatest benefit is that it accommodates to the busy lifestyles of people. We usually have a lot of other commitments. So this method of taking the class can help us study along with other commitments. Over the past few years, people are choosing online Quran classes not only for themselves but also for their children. These Islamic centers provide the facility to learn Quran for kids at very affordable rates. The cost of every online Quran course is low. The courses are more affordable and the students need not to travel to and from mosque or Islamic center. The courses also fit every student’s needs. The classes are for all age levels, and genders. What Pak Quran Academy Offers You? We are an online academy dedicated to 24/7 Quran teaching. You can have 24/7 accesses to a variety of courses that we offer. We offer separate classes for men and women for every lesson. The students can have flexible time schedules because we do not bind them to be physically present at a specific time. We are available all the time so that everyone can benefit from our service. Taking classes from our Quran Learning Online institute helps the students stay comfortable during their lessons. They can choose at any time of the day for their classes. Those who have busy schedules can also arrange classes. All the courses that we teach are mentioned on the website. You can choose the course and start learning online. Our Online Quran Academy helps the students learn according to their pace. Every student has a different concentration level. Some students learn very fast while others don’t. We help slow learners by motivating them. We have expert teachers who play a leading role to help such student. We make special efforts for every student. We give ease to our students. We try our best to remove the hardships that are associated with attending local institutes every day. We also offer trial lessons to the new students who want to join us. Three days trial classes are enough to help the students decide if they want to continue with us. These classes are the best opportunity for the students all over the world to come and join our online center and see how we teach. Contact us today to start your trial lessons with one of our expert teachers. All trial classes are free of cost. We do not charge any fee for these classes.